Do we really want to lose to this guy? The Gamecocks moved to 6-0 with another victory over a vastly inferior opponent this weekend. They also rose to #3 in the major polls, leaping like J. Clowney over pretenders LSU, Georgia and Florida State. Vanderbilt – beat Missouri 19-15. Vandy gets their first conference win and first win over an FBS team. Hey, it’s no Super Bowl, but it’s a step in the right direction if the ‘Dores want to get bowl eligible. TPR for Vanderbilt: Would like to see Vandy get back to the level they played against us, but they’re still not very good. East Carolina – lost to Central Florida 40-20. Turns out they’re just a bad football team, and Ruffin McNeill’s seat is getting warm. TPR for ECU: We will get no satisfaction out of scoreboard watching ECU this season. UAB – beat Southeastern Louisiana 52-3. The Blazers get their first win! TPR for UAB: Starting to get the ECU and UAB games confused in my head. Did we have a minor quarterback controversy mixed in there somewhere? Missouri – lost to Vanderbilt 19-15. Poor, poor Missouri. Their first season in the SEC is turning into a disaster. A late October date with Kentucky is starting to look like their best shot at a conference win. Getting bowl eligible is going to be a struggle. CBS would like a do-over on the two times they have chosen Missouri for their game of the week. TPR for Missouri: Looked like a good win, then a mediocre win, now a game we should’ve won by more. 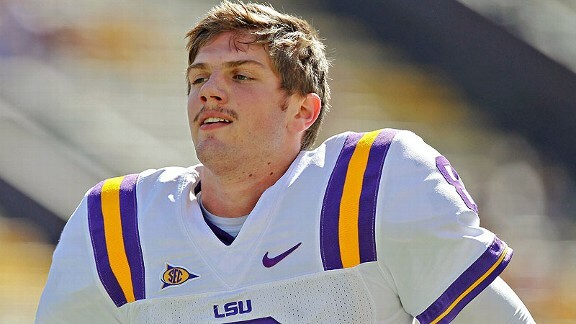 LSU – lost to Florida 14-6. LSU was a mark in the loss column for us at the beginning of the year, but their season hasn’t quite turned out as planned. Only beat Auburn 12-10?!? Still, they’re an immensely talented bunch that could put it all together at any moment. Baton Rouge at night ain’t no fun either. TPR for LSU: Slight edge to the Gamecocks right now because of a quality win over UGA. Florida – beat LSU 14-6. Not many people are mentioning the fact that Florida had two weeks to prepare for LSU. Like LSU, a stingy defense, but still trying to find an identity on offense. That identity might wind up being Mike Gillislee 30 times a game. TPR for Florida: Great defenses for us and them, an edge to us in offense, they get home field advantage…ask me after this week. Tennessee – bye week. Have lost to Florida by a lot and Georgia by a little, which makes us feel like we’re the better team. If UT isn’t in desperation mode yet, they’re right on the cusp. This game still scares me, and scares me even more if we somehow get through the gauntlet undefeated and are susceptible to a letdown. TPR for Tennessee: Scary but manageable because of their atrocious defense. Arkansas – beat Auburn 24-7 (!!!). Sorry, getting used to putting exclamation points after their games. It would be just like the ‘Hogs to get back on track just in time for us. TPR for Arkansas: Wary, but still confident. Wofford – beat Furman 20-17. The Terriers moved to 5-0 on the season, but had their first real test against the 2-4 Paladins. TPR for Wofford: STOP SCHEDULING OPTION TEAMS. Clemson – beat Georgia Tech 47-31. Something’s wrong with Sammy, he’s not being awesome. Something’s also wrong with the defense, they’re not stopping people from running to the end zone. TPR for Clemson: 4peat coming.